Click here to print the Decide To poems. These poems are available in a book. Some are available on cards and posters. To order. From the THE SAMI SUNCHILD COLLECTION of PROSE POSTERS - Dr. ROBERT MULLER PROSE POSTERS touch the hearts and lives of fans worldwide. 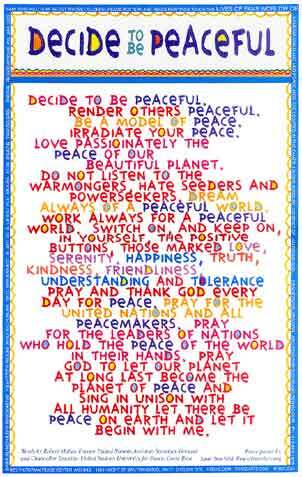 Now added to Sami's collection of peace posters in her own words are those of the remarkable peace activist, Robert Muller. 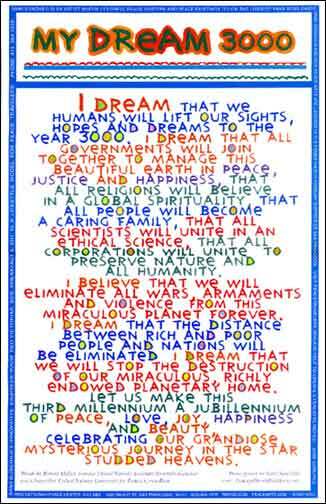 Robert Muller'sebuilient optimism envisions that we together will succeed in creating the world of our dreams. The posters are are 11 by 17 inches. What a Planet it will be! Reprinting the Decide to poems woke me up with this revelation: all my life, all my endeavors have been for a better world. My latest book (in 4 volumes) is: Ideas And Dreams For A Better World. My books can be republished as Books For A Better World, my speeches as Speeches For A Better World, Essays For A Better World, Institutions For A Better World, my autobiography, A Life For A Better World, Actions For A Better World. I am thankful for having opened my eyes to this. Now all makes sense for me. I will even call my archives at the University for Peace: Archives For A Better World. What a positive world karma this would all mean! The people are craving for a better world. Let us mobilize them as co-workers for a better world. My 34 Robert Muller Schools and writing on education could be: Education For A Better World. There would even be Businesses For A Better World. All my life could make sense and every life on earth could make full sense. Each of us can do many things for a better world. Writing Decide to poems is one way to inspire ourselves to work for a better world. Here are two Decide to poems written by Barbara Gaughen - Muller. Robert Muller and Barbara Gaughen were married, June 27, 1997 in Dobbs Ferry, New York before their children and grandchildren. Barbara is an educator, author, global public relations consultant, and public speaker, based in Santa Barbara, California. You too can write Decide to poems for a better world. Decide to be . . .
Just decide to be . . . It's your choice now to decide to be . . .
that Robert Muller was right . . .
"I love you for sure"